KIEV, September 4. /TASS/. 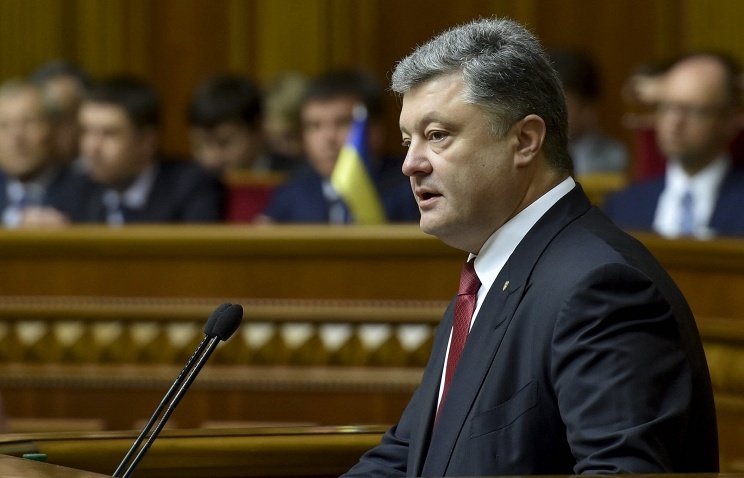 Ukrainian President Petro Poroshenko has signed a law on amendments to Ukrainian legislation on the organization and holding of the first elections to local councils and of heads of local self-governments on October 2015, the press service of the Ukrainian head of state said on Friday. Explaining the necessity of amendments to the current laws, Ukraine’s Deputy Prime Minister Gennady Zubko said following the adoption of the law on voluntary unification of territorial communities in February, a total of 6,300 communities announced their unification plans. As many as 180 communities have conducted unification and 75 more have passed decisions needed to take part in the local elections due in Ukraine on October 25. "It means that the remaining 105 communities would not be able to take part in the elections without this law and, hence, the state would have to spend more money to organize elections in just a month," he said. The new law amends the laws on local elections and on voluntary unification of territorial communities. In particular, the document changes the procedure of forming unified territorial communities. Thus, a unified territorial community is considered formed from the day of enforcement of resolutions of all the councils that took decisions on voluntary unification or from the day of enforcement of a decision on supporting voluntary unification of territorial communities taken at a local referendum. The authority to appoint first elections in a unified territorial community has been vested to the Central Election Commission.